The best compliment I can give "Before the Flood" is that both the storyline and the internal logic hung together well—which can be a problem with time-travel stories in general, but Doctor Who in particular. Picking up from "Under the Lake", the narrative split between The Doctor (Peter Capaldi), O'Donnell (Morven Christie) and Bennet (Arsher Ali) in 1980, and Clara (Jenna Coleman), Cass (Sophie Stone) and Lunn (Zaqi Ismail) back in 2119. 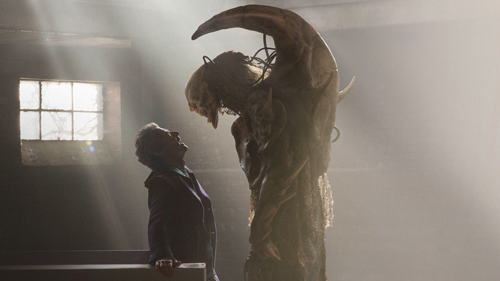 It was a clever idea to have this two-parter play out in reverse—effect and cause—so this concluding hour helped us understand last week's oddness—with The Doctor investigating the origin of the underwater ghosts, and realising they're beacons created by an alien known as the Fisher King (Neil Fingleton). In some ways we didn't really learn a whole lot more, but it was just great to get details about how everything started, and seeing The Doctor locked into a 'bootstrap paradox' (Googled it! )—contemplating whether or not to change the past, to prevent himself becoming a hollow-eyed ghost and saving Clara, or let events play out and ultimately allow The Fisher King an easy victory just to keep the timeline in order. What's a Time Lord to do? Setting most of the story in an abandoned Scottish village (dressed to resemble a Russian town for Cold War military training), gave the whole episode a chilly, desolate feel. It did seem a little cheap to go with the (ironic) idea of a ghost town for the setting, but I can forgive it. The Fisher King's costume looking terrifying in shadow and profile, but it was a shame it looked a bit cumbersome in movement and daft in broad daylight—but I appreciated the effort to create a larger, more imposing monster for once. Although the show continues its cost-saving tradition of having creatures that don't show visible faces or mouths, which I've always found a bit frustrating. Give the makeup department a challenge for once! It would be great to see a monster on the show that can properly act with The Doctor and others, rather than simply plod around and rely on dubbed voice-work. Anyway, while it's true that Clara's future end of the story was relatively weak, The Doctor's problems in the past more than compensated for that. We even got a timey-wimey sequence where he had to avoid an earlier version of himself, after the TARDIS refused to budge and instead landed thirty-minutes in the past. It's a shame more couldn't have been made of that situation, really, but I was just pleased the ending of the story came together in a surprising way that—for the most part—made enough sense. The ghosts in 2119 were actually holograms The Doctor created with the aide of his new sonic glasses, and The Fisher King was defeated by blowing up the old town's dam using one of the ship's power cells that was missing in the future. The 'thing' in the stasis chamber in the future, about to be released, wasn't the sleeping Fisher King but The Doctor himself—having completed a self-fulfilling prophecy. Overall, this was a very satisfying conclusion to the story, and perhaps firm evidence that Toby Whithouse should be next in line as executive-producer when Steven Moffat decides to call it a day. (Random fact: Moffat has now produced more episodes than his own predecessor Russell T. Davies did, so isn't it about time he let some need blood take over?) If Whithouse got the job, I'd like to think we'll get more signature episodes like this one—good, spooky, well-told stories that require a bit of thought and let their story breathe. Did you recognise the The Fisher King's scary voice? It was provided by comedian and actor Peter Serafinowicz, who also famously voiced Darth Maul in Star Wars Episode I: The Phantom Menace. Weirdly, some of the Fisher King's roars and screams were recorded by Corey Taylor—the lead singer of U.S rock band Slipknot, who is also a Whovian. It felt weird seeing The Doctor breaking the fourth wall by addressing us, the audience, at the top and tail of this episode. But it's been done before on the show: with Tom Baker in "The Invasion of Time", William Hartnell in "The Daleks' Master Plan", and Capaldi himself (sort of) did the same thing last series at the beginning of "Listen". I'm not sure how you can logically explain The Doctor's behaviour, however—unless you just believe he's talking to himself by pretending empty space is a companion. 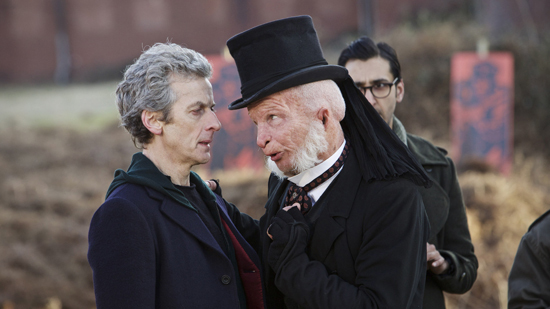 I also wonder if this will become Capaldi's "thing" now. Shout out to the fantastic sequence where deaf Cass was being stalked by Moran's ghost, who was noisily dragging an axe behind her. The way the scene switched between the axe's terrifying scraping and the silence inside the endangered Cass's head was a terrific idea. Not quite as keen on the 'vibration vision' effect (was it necessary? ), but otherwise very good. Was there some foreshadowing with 'The Minister of War' here? Someone mentioned to The Doctor by O'Donnell, that he's somehow unaware of from history. So this thing with The Doctor playing his own theme tune on electric guitar is going to stay?